The Prime Minister of Britain David Cameron has indicated that he does not want to see any of the Infantry or Cavalry regiments in Scotland removed but the Welsh equivelants apparently do not deserve the same protection. 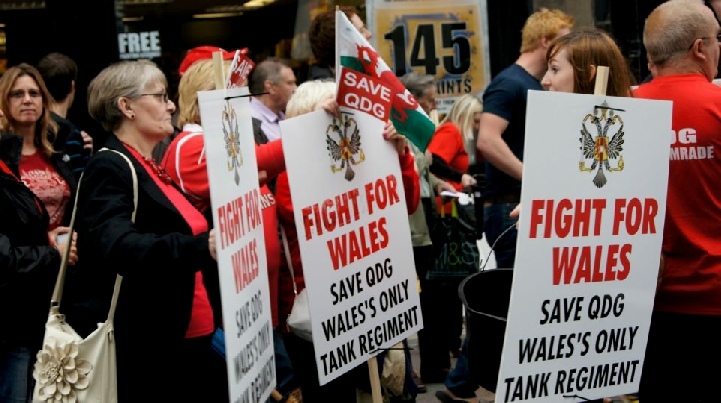 If the Welsh Cavalry is abolished,unlike Scotland which has two,there will no longer be a Welsh armoured regiment left – many jobs will be lost and yet more families will suffer from the decisions made by the out of touch London government. This is another example of the impotence Wales will continue to face unless we see the practical sense and protection sovereignity would bring to Wales. Under Welsh sovereignity the Welsh Armed Forces would keep and enhance its present regiments, including fully mobile, motorised and mechanized regiments, with the armed forces in general being similar in size and function to the forces of New Zealand, Sweden, Slovenia or Ireland. This would not only keep valuable employment and skills training in Wales but would make sure the proud military tradition of Wales is protected.